My "Can I Be Frank?" Collection is yet another in this series! So what can I tell you about this collection? Well the whole reason for it's development was the fact that I had this little frankenstein monster bouncing around inside my dome for months! He had to come out and why not with a bunch of his buddies? So there ya go.... and here ya are.... my salute to Halloween and all those memories of pillowcases full of candy! Oh to be a kid again, hey? 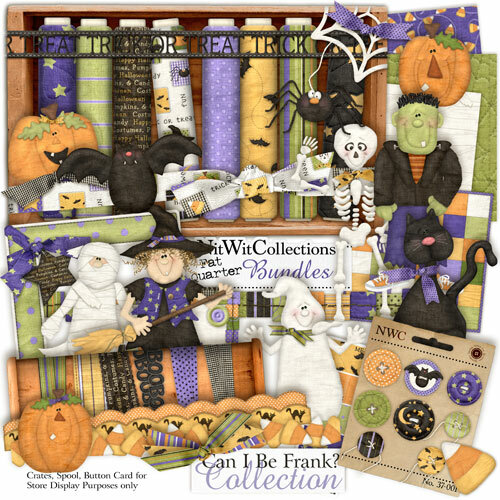 Hope you are inspired to make lots of layouts for all your little monsters! Are ya ascared, people? Huh? Are ya?